So you might have noticed that I am still on a soup kick. It may have something to do with the constant deluge of rain blown sideways by strong gusts of wind. This soup, in particular, is designed to use winter veggies like sweet potato, squash and mushrooms with fresh ginger in a deliciously spicy red curry, coconut milk broth. I added tofu for extra protein and millet, brown rice ramen noodles to make a pretty hearty meal in a bowl. I love the spicy but comforting flavors of this soup. It’s loaded with vegetables that make it a nutritional feast but also provide interest. Each spoonful is a different culinary adventure, from the creaminess of the sweet potato, to the earthy mushrooms and the just tender bok choy all swimming in a yummy coconut curry broth. What really makes it though, is the garnishes of sliced red onion and fresh cilantro (or parsley if you’re not a cilantro lover), so don’t skip this step. You can use whatever vegetables you prefer or have on hand. Japanese eggplant would be a good choice. Just keep in mind that some veggies take longer than others to cook. TIPS: I used whole grain ramen noodles which I was trying for the first time. They had a good flavor and texture but broke into small pieces which made it easier to eat but not quite as pretty as intended. Rice vermicelli or spaghetti would hold it’s shape better. This recipe calls for several Thai spices which are easy to find in my grocery stores. I’ll admit that the list of ingredients is pretty long but each adds an important flavor to the mix. If you don’t have the ingredients or can’t be bothered to buy them, you may be lucky enough to find a curry soup base in your market. Just add the fresh ingredients and you’re done. Draining the tofu isn’t absolutely necessary, especially if you are pressed for time, since it’s going into a liquid base, but I prefer to squeeze out the water it was packed in to allow the flavors of the broth to be absorbed. It makes the tofu more flavorful. Add sweet potato, tofu and squash (If you are using zucchini, add with the bok choy) and simmer for about 10 minutes. Add bok choy, mushrooms and noodles and cook another five minutes. Serve topped with sliced red onion, chopped fresh cilantro and maybe a drizzle of sriracha. 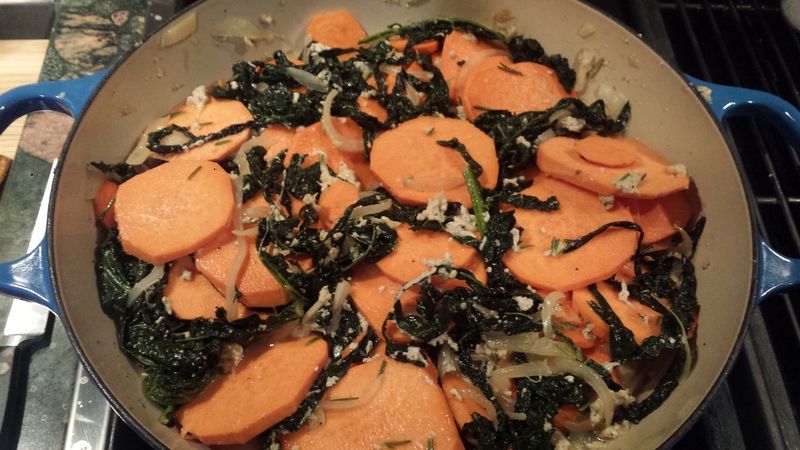 Add sweet potato and squash (If you are using zucchini, add with the bok choy) and simmer for about 10 minutes. Comfort food. For some people that might be chicken soup or macaroni and cheese but whatever your go to dish might be, you may want to add this creamy, savory, slightly sweet and surprisingly rich gratin. I love when readers send me recipes or offer suggestions! 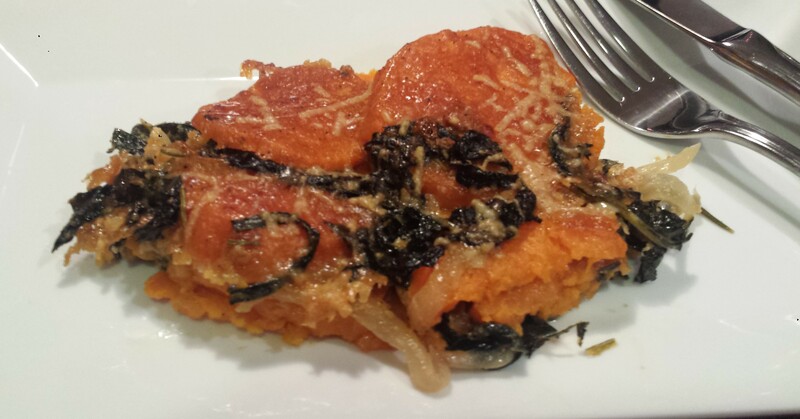 I was at a book event last week when reader and friend, Patti Boston, asked me if I had made the Sweet Potato and Kale Gratin that was featured in the San Francisco Chronicle last week. Patti had tried the recipe and loved it, so what was I to do? Of course I had to give it a try. Now this is not a combination I would normally have made up on my own, so I followed the recipe pretty carefully, with one exception. Instead of using one cup of whole milk and one cup of heavy cream, I used 1 1/2 cups of milk and 1/2 cup of plain yogurt. 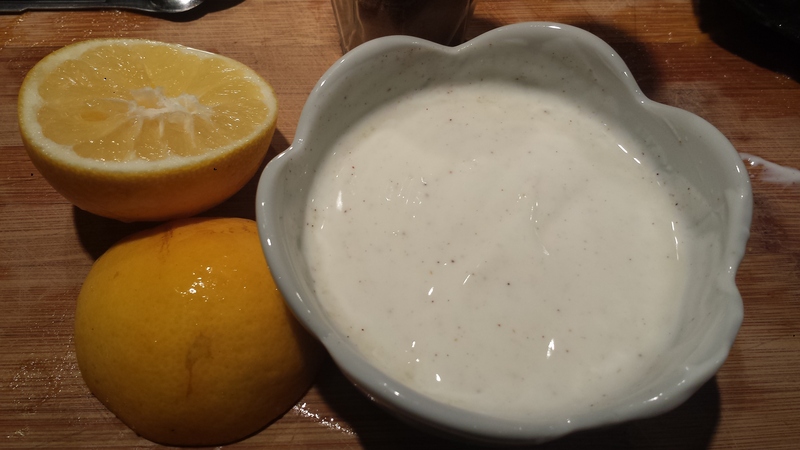 I often use plain yogurt to replace some of all of the cream, sour cream or mayo that is called for in many recipes. I think it’s a healthier option and provides great results. My favorite milk and yogurt are from local, Straus Family Creamery. Not only do I love their products but I appreciate their dedication to animal welfare, including the calves, which is not common in the dairy industry. All their cows are free to roam in pastures and are fed organic, non-GMO food. The creamery is also environmentally aware, using reusable (and returnable) glass bottles and renewable power in their methane digester (yes, I’m talking about poop to power). Kale is still the darling of the culinary world and rightly so. It reigns as one of the world’s healthiest foods, providing protein, fiber and a wealth of vitamins and minerals. Sweet potatoes add more than just a creamy, sweet flavor. They are a great source of beta carotene, as evidenced by their brilliant orange color. Did you know that adding a bit of fat to your sweet potatoes allows your body to maximize the nutrition, or make it more usable? (So don’t sweat that pat of butter). 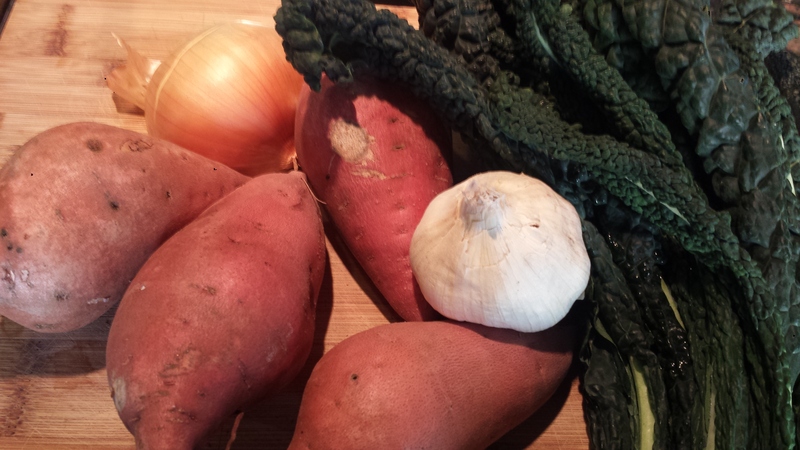 Together, kale and sweet potatoes make a delicious and nutritious team. Let me know if you try it. As always, I appreciate photos and will post them to my You Made It! page. 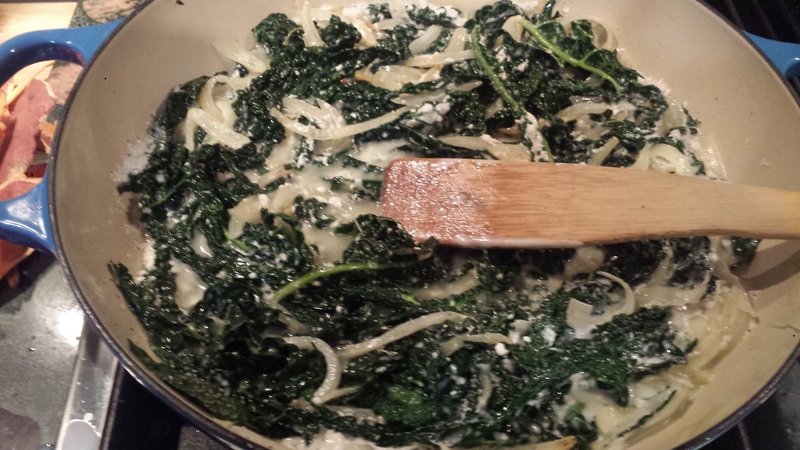 TIP: If you have a pan that can go from stovetop to oven, this becomes a one pot dish. 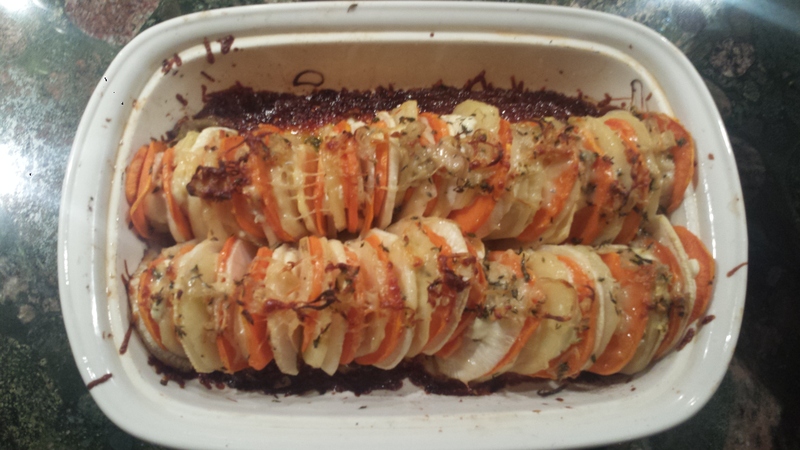 Otherwise saute the vegetables on the stovetop then pile it all into a buttered baking dish to bake in the oven. I chose to use a combination of whole milk and plain yogurt but you can use half milk and half heavy cream, as the original recipe calls for, or any combination that appeals to you. Next time I make this dish I will most likely consider replacing some or all of the milk and cream with vegetable broth as a lower calorie, less fat option. Preheat oven to 350 degrees. 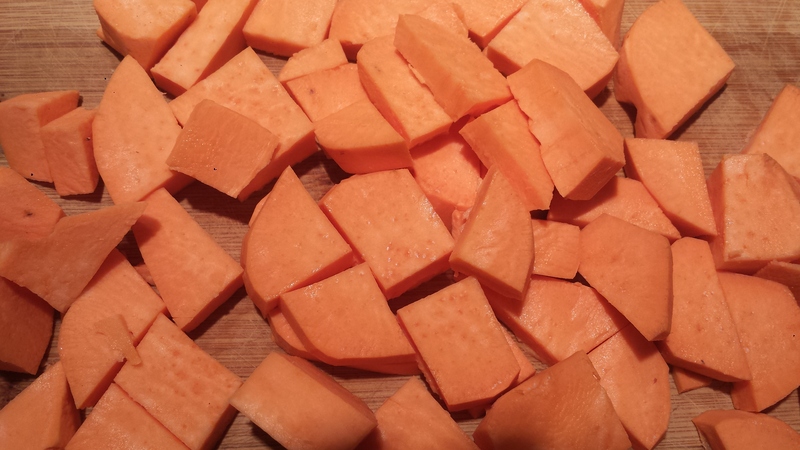 Peel and slice sweet potatoes into 1/4 inch rounds. Set aside. 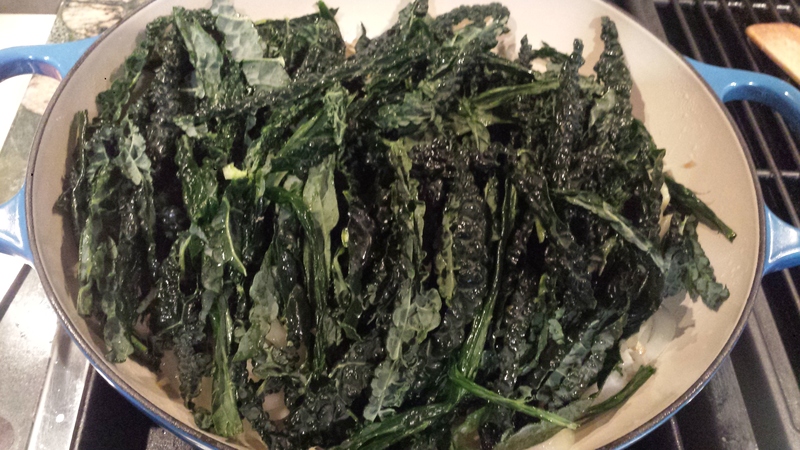 Remove the tough core of the kale and slice into julienne strips. 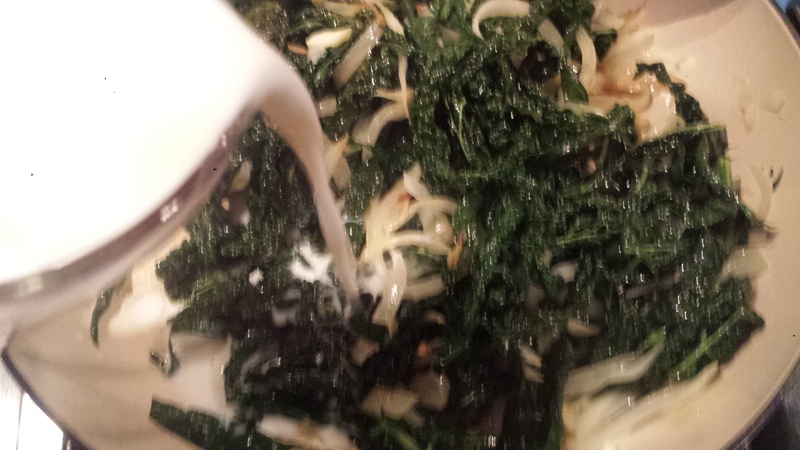 When the onions are soft and translucent, add the kale, cover again, and cook until tender, about 5 minutes. Sprinkle with salt, pepper and nutmeg. Stir in the rosemary. Add the milk and yogurt, bring to a simmer, and cook about 10 minutes until reduced by one-quarter. Remove from the heat and season with more salt; you will want the mixture on the salty side. 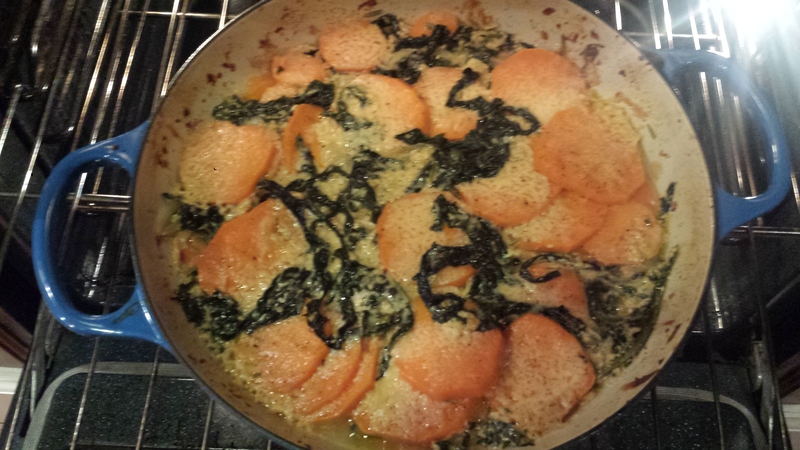 With the pan off the heat, add the sliced sweet potatoes and 1 cup of the Parmigiano-Reggiano. Stir to coat the slices. Butter a 10-inch round or oval gratin dish. Transfer the potato mixture to the gratin dish, spreading it evenly in the dish. You may need to add a little extra milk; it should look like a little liquid is seeping out of the gratin. Top with the remaining ½ cup of cheese.Cover the gratin with aluminum foil and bake for 45 minutes, or longer until fork tender. Uncover, then bake another 15-20 minutes, until the top is brown. Serve hot or at warm room temperature. Preheat oven to 350. 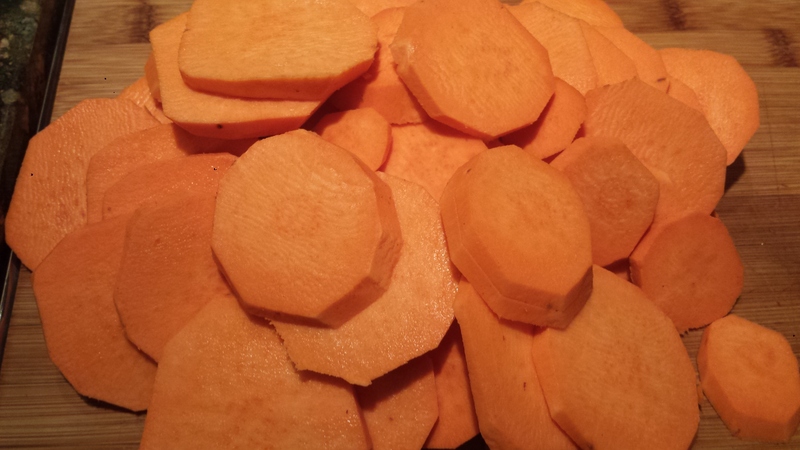 Peel and slice sweet potatoes into 1/4 inch rounds. Set aside. Butter a 10 inch round or oval gratin dish. Transfer the potato mixture to the gratin dish, spreading it evenly in the dish. You may need to add a little extra milk. 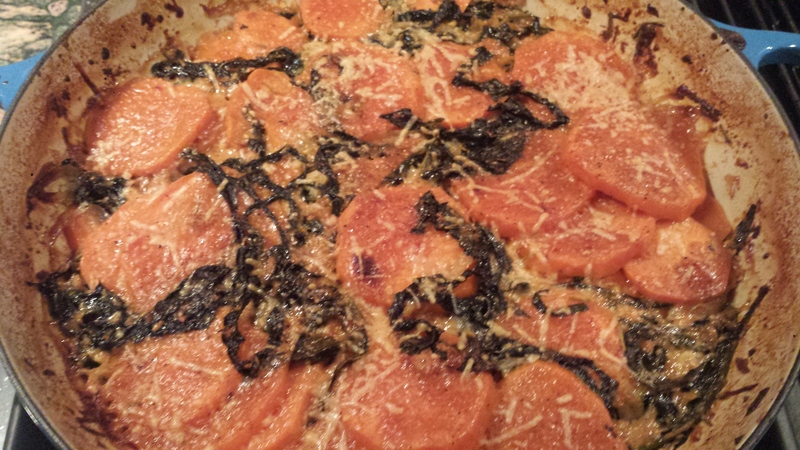 It should look like a little liquid is seeping out of the gratin. 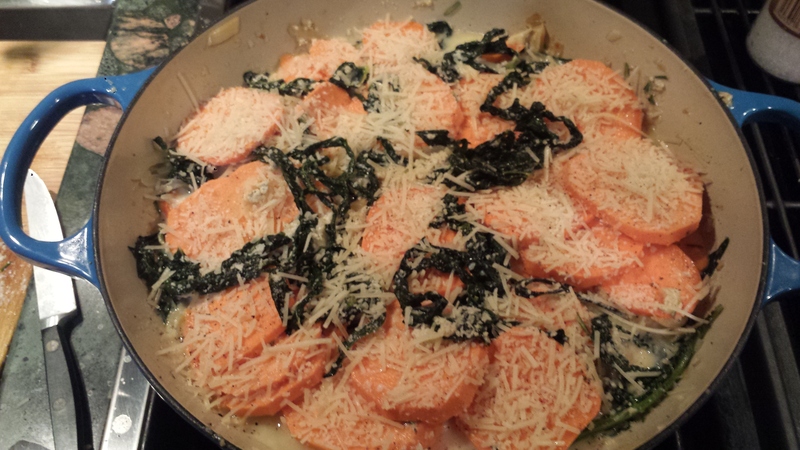 Top with the remaining 1/2 cup parmesan. 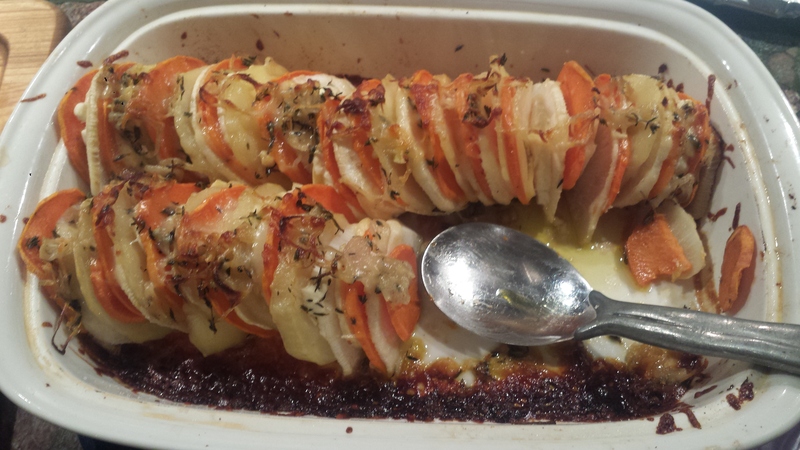 Cover with aluminum foil and bake for 45 minutes or longer, until fork tender. Waiter, there’s turmeric in my soup! I love soup! It’s a meal in a bowl – easy preparation, easy clean up. One or two days with a tiny drizzle is enough incentive for me to drag out my big soup pot. There is nothing quite like a big pot of soup bubbling away to make your kitchen feel cozy and smell heavenly. 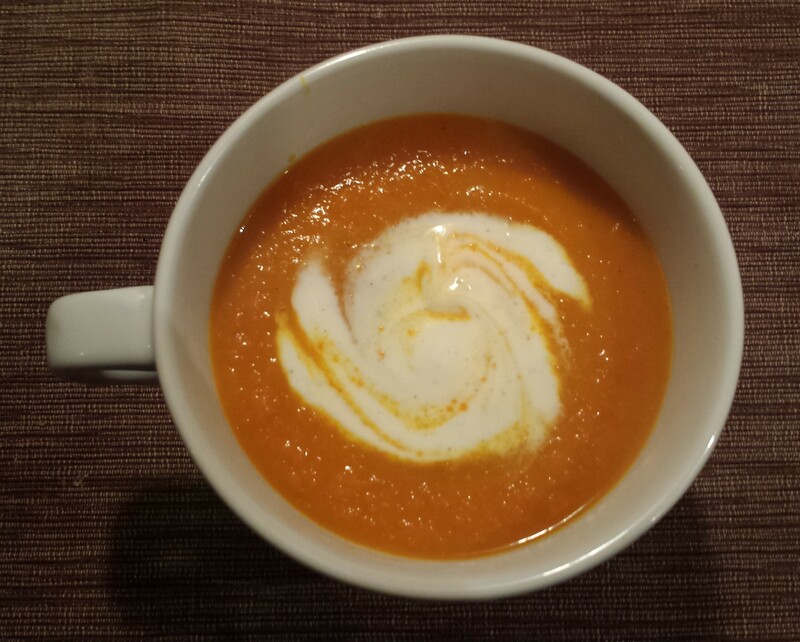 I have made carrot soup before, Carrot Coconut Soup, which I loved but I ran across a recipe for Roasted Carrot Turmeric Soup from Love and Lemons and was intrigued by the use of turmeric, that wildly popular spice touted to be the cure for whatever ails you. I mean it’s even in my daily vitamin! So what’s the real skinny on Turmeric? 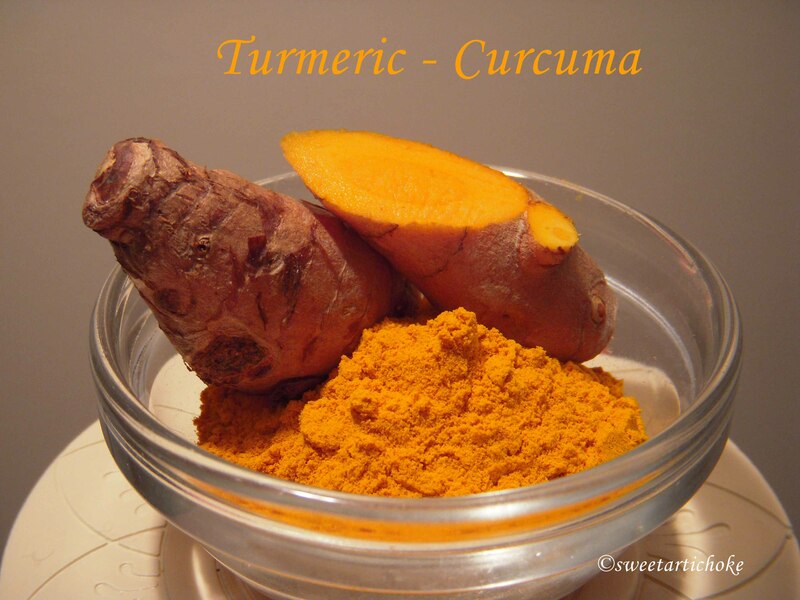 Turmeric is in the ginger family and comes from the root of the Curcuma longa plant. It’s spicy ginger-like flavor is the main ingredient in curry powder and is common in South Asian foods. Turmeric has been used for a very long time in Asia (primarily in China and India), not only for its distinctive flavor but also for it’s powerful healing properties. We may be slow to the party but the Western World has recently ‘discovered’ the many benefits of turmeric. Why is turmeric considered so great? Can it really prevent Alzheimers, cancer and depression (among other claims) or is it all a bunch of hype? Well, turmeric might just be all that. According to the Journal of the American Chemical Society, Turmeric contains a wide range of antioxidant, antiviral, antibacterial, antifungal, anticarcinogenic, antimutagenic and anti-inflammatory properties. It is also loaded with many healthy nutrients such as protein, dietary fiber, niacin, Vitamin C, Vitamin E, Vitamin K, sodium, potassium, calcium, copper, iron, magnesium and zinc. These properties are believed to help treat a variety of conditions. Here are 10 Health Benefits of Turmeric including prevention of cancer, liver disease and Alzheimers, controlling diabetes and relieving arthritis and more… The list is quite impressive. Did you know a sweet potato is not really a potato? Shocking, I know. It’s actually the elongated root of a vine in the morning glory family. Who knew? Turmeric is not the only goodie in this soup. Carrots and sweet potatoes (and other foods in the orange/yellow food group) are loaded with vitamins, antioxidants and phytonutrients. I think I’ll have another bowl of soup! TIPS: Try to resist the urge to peel the carrots if at all possible, since most of the nutrients are right under the skin and are lost in the peeling process. Use a scrub brush or sponge instead and dry with a paper towel. All veggies can be cut roughly since they will be pureed with a food processor or blender once they are soft so size doesn’t matter. Turmeric has a beautiful bright yellow/orange color which is used in dying textiles, however, it will also dye your cutting board or food processor (or anything porous it touches), so add the turmeric and curry powder after the vegetables have been pureed. I would recommend adding 1 teaspoon of each, taste for spiciness and then add more to taste. This original recipe called for all vegetables to be chopped, drizzled with olive oil and roasted in the oven at 400 degrees for 25 minutes or so before pureeing which may give the soup a richer flavor, so try that if you have the time and inclination. I was a bit short on time so opted to make this a one pot meal, easy preparation and easy cleanup, plus great results! Scrub carrots instead of peeling. 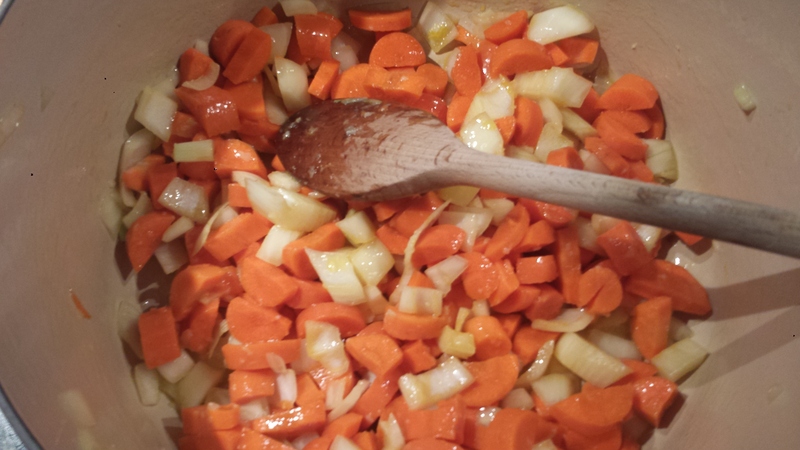 Roughly chop carrots and onion. Peel and coarsely chop the sweet potato. 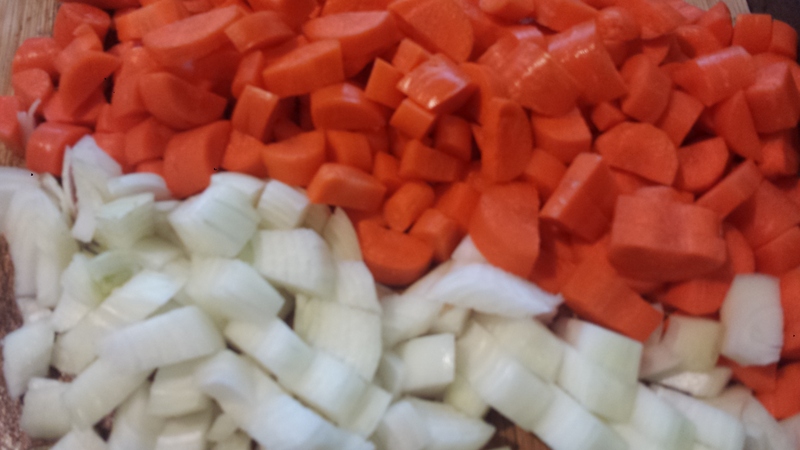 Add to the onions and carrots. 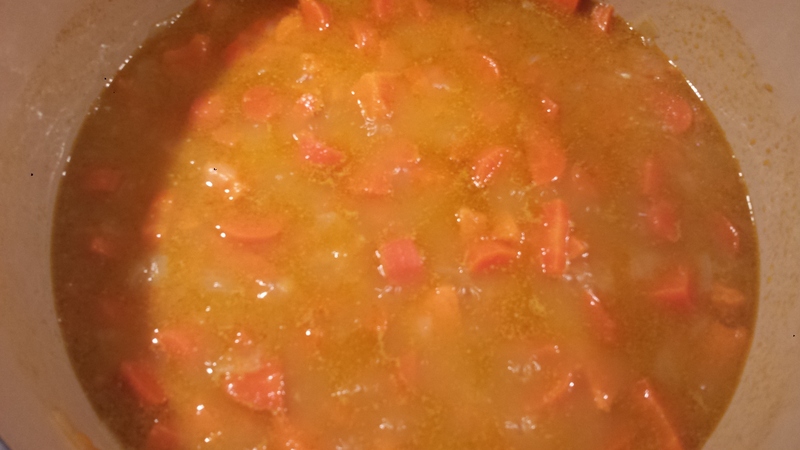 Add vegetable stock, reduce heat and simmer covered for about 20 minutes. When the vegetables are fork tender, let cool slightly and process in a food processor or blender in batches until silky smooth. 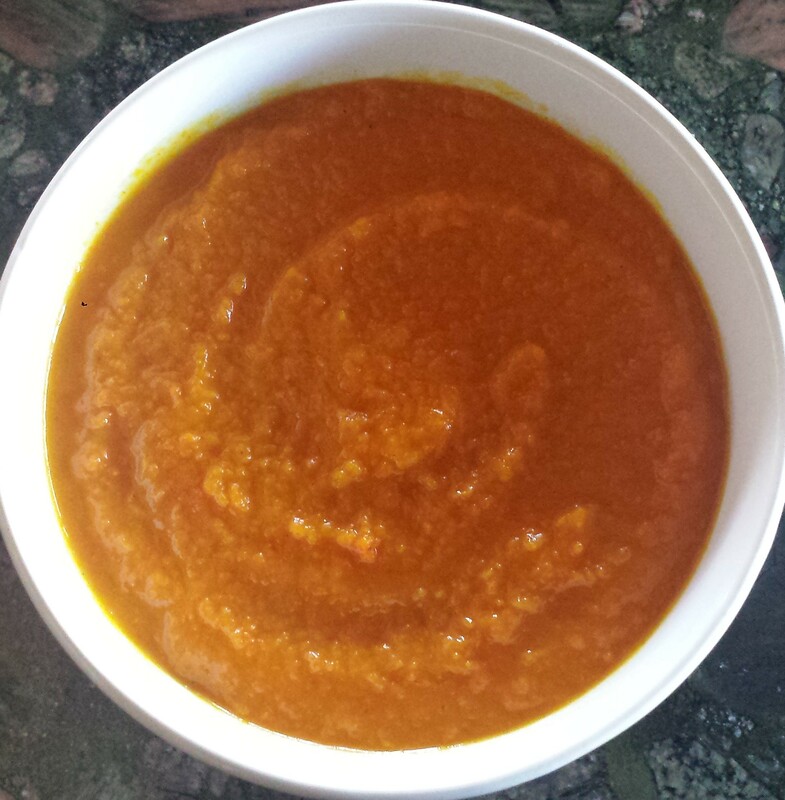 Rinse out soup pot and return vegetable puree. Add one or two cusp of water if needed. Add 1 teaspoon each of turmeric and curry powder, pinch of cayenne and 1 Tablespoon of apple cider vinegar. Taste and add more if desired. Add salt and pepper to taste. Combine all ingredients in a small bowl and refrigerate until needed. 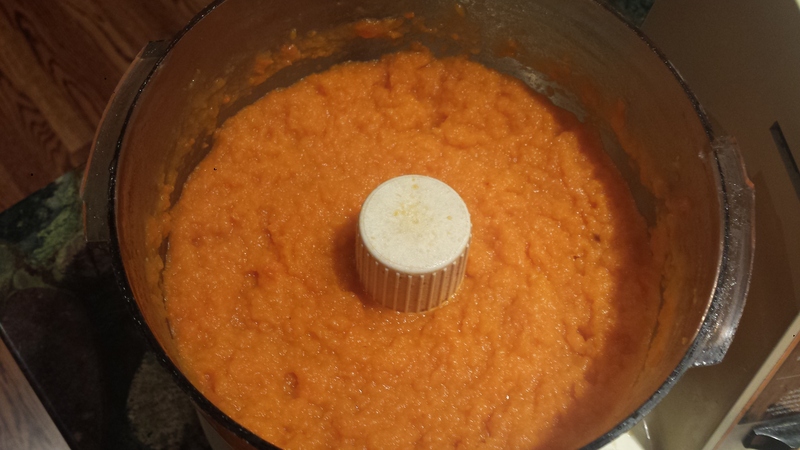 Rinse out soup pot and return vegetable puree. Add one or two cups of water if needed. Add 1 teaspoon each of turmeric and curry powder, pinch of cayenne and 1 Tablespoon of apple cider vinegar. Taste and add more if desired. Add salt and pepper to taste. 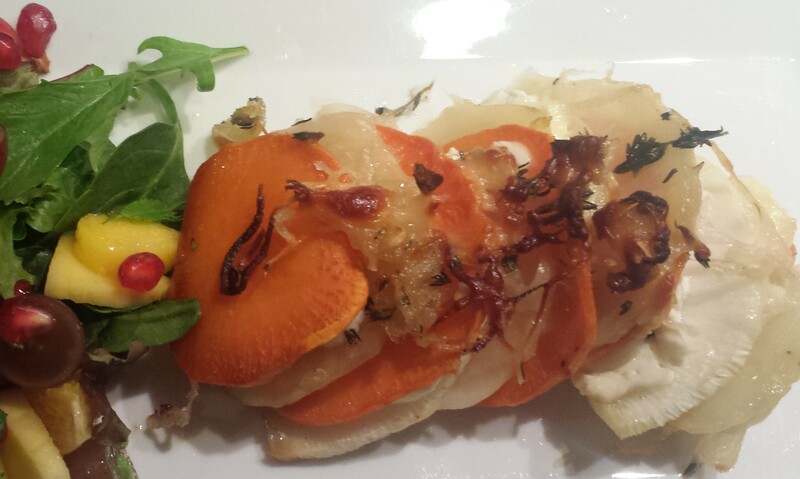 Root vegetables are like your underappreciated friend who is super smart and really fun but maybe a bit socially awkward and not classically attractive. 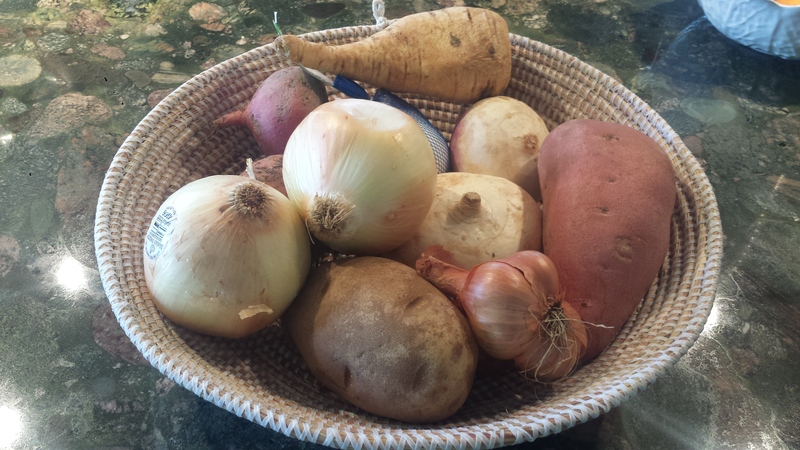 Root vegetables grow in the ground, have tough skins, which are sometimes ‘hairy’ (egad!) and are often a bit misshapen. They have none of the allure of ‘popular’ vegetables like tomatoes, eggplant or the reigning queen of greens, kale. Yes, root vegetables are not very pretty on the outside with their dusky, tough skins, but cut them open to find a treasure trove of jewel tones and lovely, often intense flavors. Since they are grown underground, they absorb a great amount of nutrients from the soil. They are packed with a high concentration of antioxidants, Vitamins C, B, A, and iron.. They are also filled with slow-burning carbohydrates and fiber, which make you feel full, and help regulate your blood sugar and digestive system. This factor, plus the high-octane nutrients and low calories, make roots excellent for people who are trying to lose weight, or simply stay healthy. Read more at Oh My Veggies. This summer I made a beautiful Summer Vegetable Tart featuring summer produce like zucchini, yellow squash, eggplant and fresh tomatoes with rounds of fresh mozzarella arranged into a gorgeous flower pattern. It was definitely a family and a fan favorite so check it out if you still have tomatoes and zucchini left in your garden! With fall vegetables crowding the bins in markets right now, I wanted to rework the tart into one featuring fall veggies, root vegetables in particular. Whereas summer veggies have a lot of water in them, root vegetables are more dense, so I opted to make a tian which is a mixture of roasted vegetables cooked in a shallow dish, usually layered or arranged with cheese or au gratin but without a crust which seems unnecessary for these already hearty vegetables. A tian is actually the earthenware cooking pot used in Provence, France, although the name Tian now serves to include the food cooked inside. Most people, like me, don’t have a special tian dish but use any low glass, ceramic or earthenware dish available. I topped the vegetables with thinly sliced shallots, fresh herbs, garlic and a sprinkle of freshly grated parmesan cheese for a slightly crispy finish. 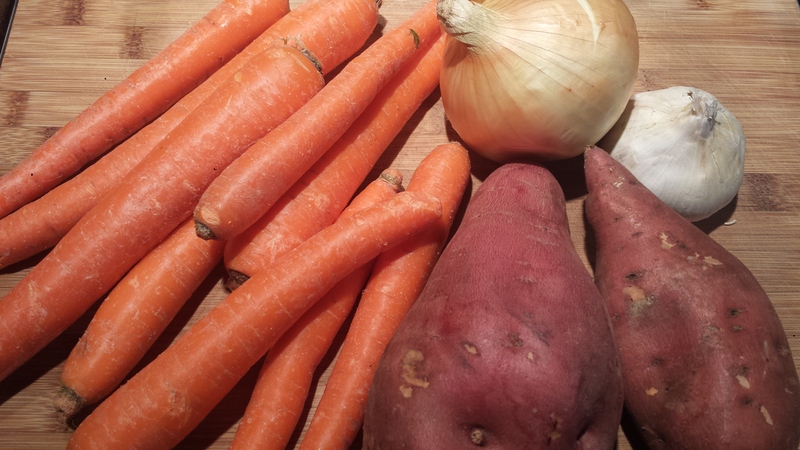 TIPS: Utilize any combination of your favorite root vegetables or whatever is available, even carrots. Try to buy vegetables that are similar in diameter so they cook evenly and make the layering easier. Don’t worry to much about it though. If anything is significantly smaller, just double up the smaller rounds or tuck them in wherever. I used goat cheese because I thought it’s tangy flavor would combine best with the earthy veggies but non goat cheese lovers can omit or substitute any cheese. You have the option of tucking it in between layers like I did or crumbling it all over the top for a bubbling, crispy, cheesy crust. If you are pressed for time, you can skip the marinating of the shallots, they just might not get as crispy but they will be delicious. You can’t really go wrong. 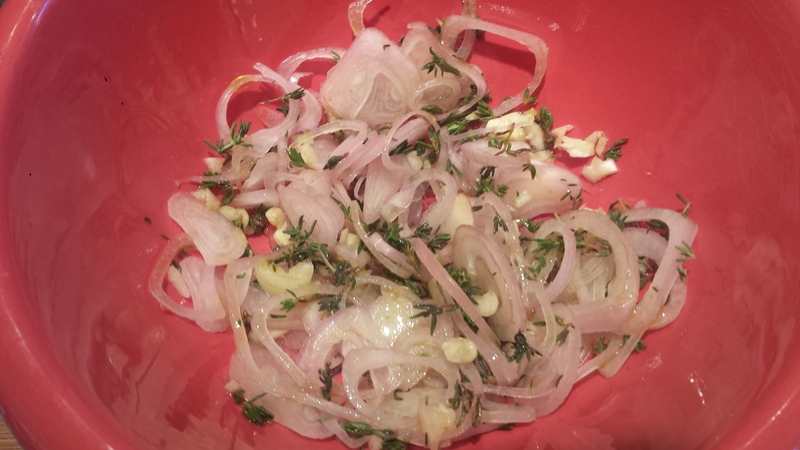 Slice a shallot into thin rings and put in a small bowl. Add the minced garlic and 1 tsp fresh thyme (or other fresh savory herb like oregano, rosemary or marjoram. Drizzle with 1 Tablespoon olive oil and combine to coat. Set aside. Preheat the oven to 400 degrees and lightly grease a baking dish with olive oil. Peel the potato and slice into 1/4 inch thick rounds. 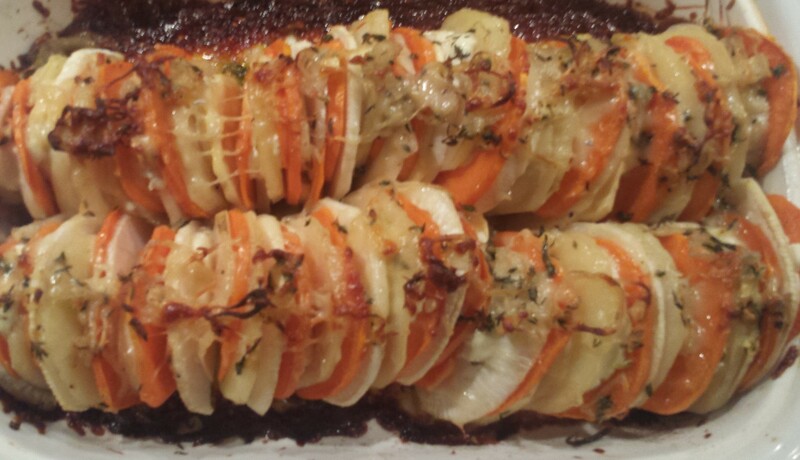 In the baking dish, arrange the potato, parsnip and sweet potato slices in a single layer, overlapping them as you go. Tuck in a round or crumbles of goat cheese, if using, every 3 or 4 slices or you can sprinkle them overt the top or both. The shape of your dish will determine the pattern you use for your veggies. Think rows, circles or even pinwheels. 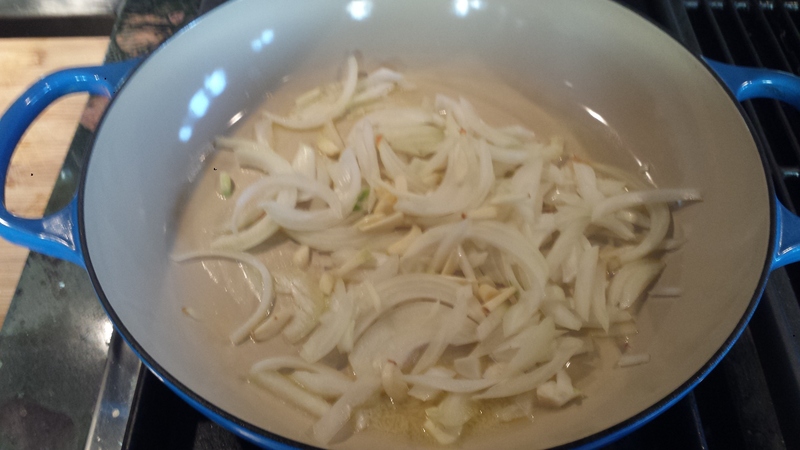 Sprinkle the garlic mixture evenly over the top. Drizzle the top with olive oil, and season with salt and pepper. if you like softer veggies you can pour a half cup of vegetable broth in the bottom of the pan (optional). For firmer veggies, omit the broth. Cover the dish tightly with aluminum foil. 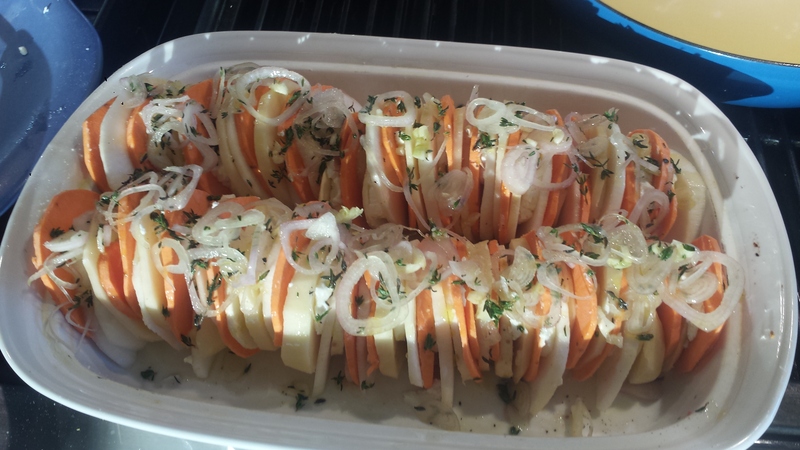 Place the root vegetable tian in the preheated oven and bake for about 30 minutes, or until potatoes are starting to become fork tender. Remove foil and sprinkle some grated Parmesan cheese over the top, then continue baking until cheese turns golden brown, about 5-10 minutes. If you like the top really browned, broil for a minute or two but watch it closely as it can overbrown quickly. Peel the potato and slice into 1/4 inch thick rounds. 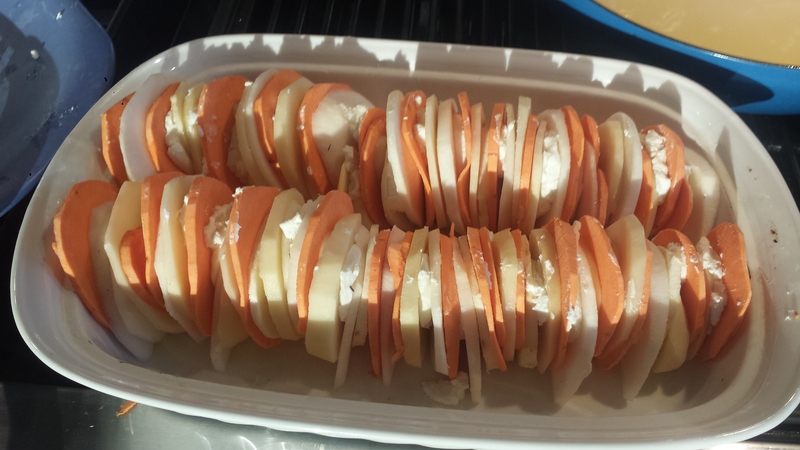 In the baking dish, arrange the potato, parsnip and sweet potato slices in a single layer, overlapping them as you go. Tuck in a round or crumbles of goat cheese, if using, every 3 or 4 slices or you can sprinkle them overt the top or both. 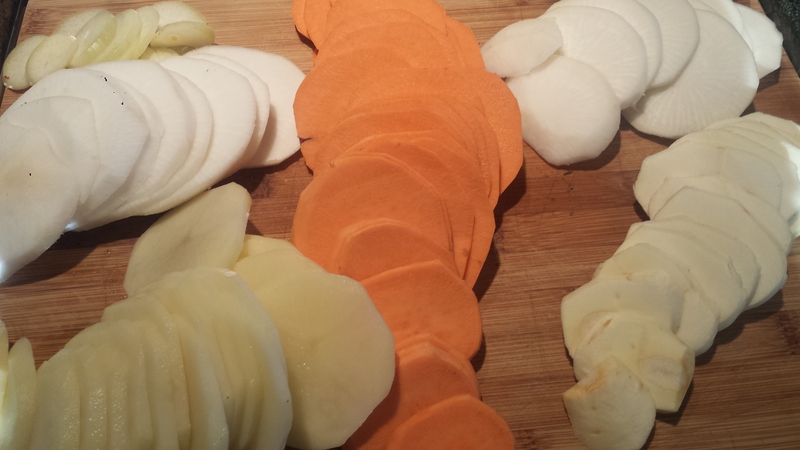 The shape of your dish will determine the pattern you use for your veggies. Think rows, circles or even pinwheels..